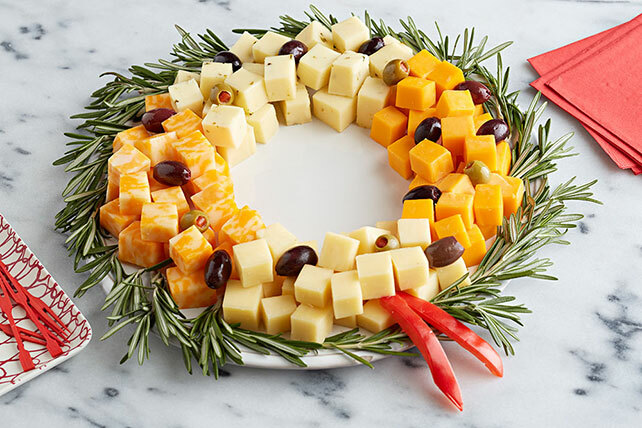 Arrange a variety of creamy cheese cubes, add some olives and then enjoy your Easy Cheese Wreath. Easy Cheese Wreath is ready to eat in just 20 minutes. Place 10-inch circle of parchment paper on plate. Arrange rosemary sprigs around edge of parchment. Top rosemary with cheese cubes and olives to resemble photo. Add pepper strips for the ribbon. Enjoy eating appetizers at a social occasion but be mindful of portion size. Prepare using other flavors of CRACKER BARREL Cheese, such as CRACKER BARREL White Cheddar Cheese with Jalapeño Peppers or CRACKER BARREL White Cheddar Cheese with Mediterranean Herbs.